You'll be £25.00 closer to your next £10.00 credit when you purchase The Coming of the Comet. What's this? In August 1812 Henry Bell’s Comet, a revolutionary paddle steamer, made her first journey on the Clyde. This marked the start of extraordinary developments that completely transformed shipping and transport in Britain, Europe and the Americas. The paddle steamer soon became the key link with Empire, pushing the Honourable East India Company’s wooden walls off the seas; it provided the all- important link with the Americas, and it offered emigrants to the New World a means of pushing westwards. In this fascinating new book Nick Robins analyses the remarkable impact of the paddle steamer and goes on to describe its development, both in terms of technology design and in relation to its effects on the transformation of nineteenth-century economies. He includes all Henry Bells disciples - the Burns brothers, Laird, Napier, Fulton, Syminton Cunard and Denny to name a few, and looks at their individual contributions. The impact of the paddle steamer on transport is difficult to overstate. It helped with the export of cotton from the American southern states, and with the transport of oil from Burma’s oil fields. The great stern wheelers of the Mississipi are legendary, but they also migrated to the Murray and Darling rivers in Australia, and to the Congo and Nile rivers in Africa, and the great rivers of Russia. This wonderful story of nineteenth-century ingenuity will appeal to shipping enthusiasts and those with a wider interest in industrial history. 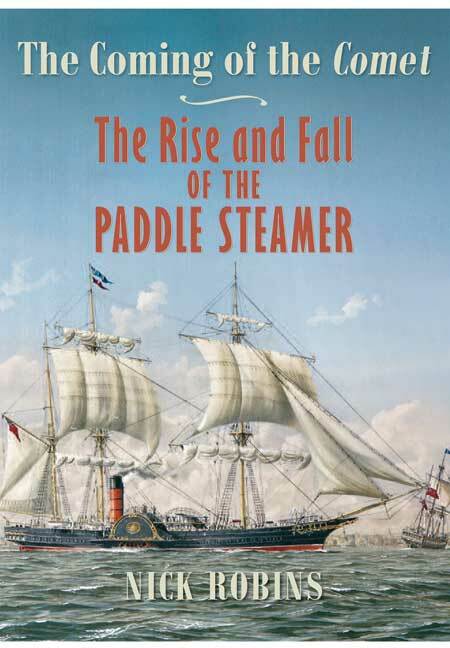 This detailed hardback book looks at the development of the paddle steamer, starting with henry bells famous comet, which made her first journey on the clyde in 1812. This is the first single-volume work covering the development of paddle steamers on both sides of the Atlantic and its publication coincides with the 200th anniversary of Henry Bell’s Comet. As the author so ably demonstrates, the impact of the paddle steamer on transport is difficult to overstate and was also linked to a range of technological developments in the 19th Century which are also discussed in some depth. All-in-all, this is a well-illustrated and fascinating account of 19th Century ingenuity and its revolutionary effects on maritime communication and naval warfare. This is an excellent book backed up with some very good quality photographs, many of which are rare and seldom seen. I would very highly recommend this book to our readers.